Here are some examples of typical exercises for your condition. Start each exercise slowly. Ease off the exercise if you start to have pain. Your doctor or physiotherapist will tell you when you can start these exercises and which ones will work best for you. Stand tall with your chin slightly tucked. Imagine that a string at the top of your head is pulling you straight up. Keep your arms relaxed. All motion will be in your shoulders. Shrug your shoulders up toward your ears, then up and back. Circle your shoulders down and back, like you're sliding your hands down into your back pants pockets. Repeat the circles at least 2 to 4 times. This exercise is also helpful anytime you want to relax. With your arms about shoulder height, clasp your hands in front of you. Reach straight forward so you are rounding your upper back. 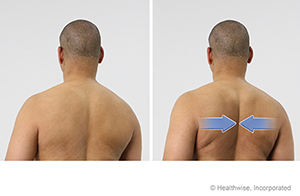 Think about pulling your shoulder blades apart. You'll feel a stretch across your upper back and shoulders. Hold for at least 6 seconds. Reach your arm straight up. Keeping your elbow in place, bend your arm and reach your hand down behind your back. 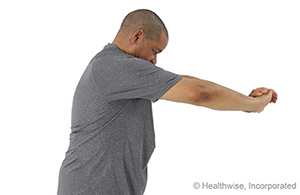 With your other hand, apply gentle pressure to the bent elbow. 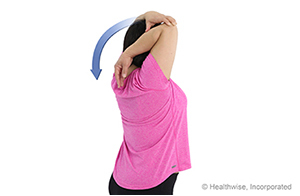 You'll feel a stretch at the back of your upper arm and shoulder. Hold about 6 seconds. Repeat 2 to 4 times with each arm. Raise one arm to shoulder height, and reach it across your chest. Pull the arm slightly toward you with your other arm. This will help you get a gentle stretch. Hold for about 6 seconds. 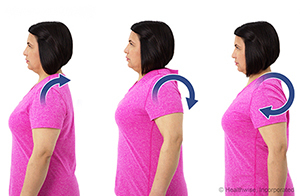 Sit or stand up tall with your arms at your sides. Keep your shoulders relaxed and down, not shrugged. Squeeze your shoulder blades together. Hold for 6 seconds, then relax. Sit or stand tall. Relax your shoulders. 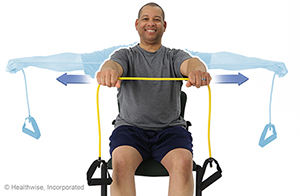 With palms down, hold your elastic tubing or band straight out in front of you. 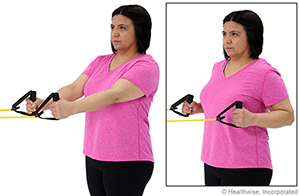 Start with slight tension in the tubing or band, with your hands about shoulder-width apart. Slowly pull straight out to the sides, squeezing your shoulder blades together. Keep your arms straight and at shoulder height. Slowly release. Anchor your elastic tubing or band at about waist height. Take one end in each hand. Sit or stand with your feet hip-width apart. Hold your arms straight in front of you. Adjust your distance to create slight tension in the tubing or band. Slightly tuck your chin. Relax your shoulders. Without shrugging your shoulders, pull straight back. Your elbows will pass alongside your waist. Anchor your elastic tubing or band in the top of a closed door. Take one end in each hand. Either sit or stand, depending on what is more comfortable. If you feel unsteady, sit on a chair. 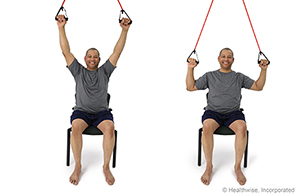 Start with your arms up and comfortably apart, elbows straight. There should be a slight tension in the tubing or band. Slightly tuck your chin, and look straight ahead. Keeping your back straight, slowly pull down and back, bending your elbows. Stop where your hands are level with your chin, in a "goalpost" position. Lie on your back. Raise your knees so they are bent. Plant your feet on the floor, hip-width apart. Tuck your chin, and relax your shoulders. Reach your arms straight out to the sides. If you don't feel a mild stretch in your shoulders and across your chest, use a foam roll or a tightly rolled blanket under your spine, from your tailbone to your head. 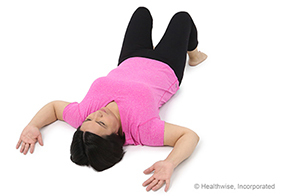 Relax in this position for at least 15 to 30 seconds while you breathe normally. Repeat 2 to 4 times. As you get used to this stretch, keep adding a little more time until you are able relax in this position for 2 or 3 minutes. When you can relax for at least 2 minutes, you only need to do the exercise 1 time per session. Reach your arms straight out to the sides. Bend your arms at the elbows, with your hands pointed toward the top of your head. Your arms should make an L on either side of your head. Your palms should be facing up. 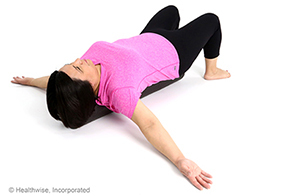 If you don't feel a mild stretch in your shoulders and across your chest, use a foam roll or tightly rolled blanket under your spine, from your tailbone to your head. Each day you do this exercise, add a little more time until you can relax in this position for 2 or 3 minutes. When you can relax for at least 2 minutes, you only need to do the exercise 1 time per session. Enter H745 in the search box to learn more about "Shoulder Blade: Exercises".